Posted	 March 14, 2017 by	Sikh Dharma Ministry & filed under Ministry, Sikh Art Corner. To my surprise he asked how much I charged. I had thought it such a blessing to do this as seva that his question caught me off guard. I managed to answer with the amount I regularly charged for men’s chollas. “That’s not enough!” he barked. Thinking quickly, I doubled the amount. He said “OK” and we shook hands. So many lessons to be learned in that brief exchange. First: use my business mind. Second: value my work. Third: it can still be a labor of love even when receiving payment. It was certainly a great help in supporting myself and my children. Here is one of my favorite stories from those good ol’ days. The Siri Singh Sahib called me in, gave me a garment he had received and asked me to remake it. It was beautiful silk fabric with lots of gold woven into the design, but it was not his style of dress. I was prepared to drop what I was working on and start on it right away but he wanted it done and delivered by the next morning for a wedding! “Sir!”, I exclaimed, “Even if I stay up all night, it will take many hours just to take the stitches out before it can be re-cut. I’ll need help.” “Who would you like to have help you?” he asked. I gave him a name and he ordered her to help me. Fortunately she was knowledgeable about tailoring and even more fortuitously, she had complementary fabric she was willing to give for the project. So she came to my house where my sewing space was in my bedroom. First we did an Ardas, then she ripped and I sewed. Later that night something happened that had never occurred before– my sewing machine malfunctioned! Work came to a halt and we were nowhere near finished. Quitting was not an option. Quickly we gathered all the materials and went to a friend’s house to use her machine. We let Siri Singh Sahibji know where we were and why we moved locations. He laughed at our predicament. When we told him we would have to stay up all night in order to finish on time, he laughed more, saying how we were being tested as he had been tested by his teacher. Just after dawn we drove from Albuquerque to Espanola with the finished gown. We sat across from the dome, waiting for him to come out, wearing it. “What if the staff gives him something else to wear? What if he isn’t wearing our creation?”, we fretted. When he came out with it on, it was like the sun rose all over again, blinding us with his brilliance. What a wonderful feeling to deliver with excellence to the Master, overcoming all obstacles and self-limitations! The day came when Siri Singh Sahibji asked me to make him a Mahan Tantric robe. He sat down at the table, asked for some drawing paper and pencils and he began to draw, explaining as he went along. On the front were many religious symbols from different faiths. On the back were hockey sticks and pucks, a tree of life, a vase of flowers and three short lines representing the mind. He specified the colors and fibers to be used, saying the robe needed to be lined with a blue the same color as a parakeet in India. At some point I became aware that his foot was resting on top of mine and I thought to move it. With a start I realized the creative energy was flowing in both directions, and decided to leave my foot right where it was! To get this project done required much collaboration. One person donated funds for fabric, another bought silk in Los Angeles, and another advised me on how to appliqué since I had not done that technique before. It was the most challenging project I had ever undertaken, and the most gratifying. Seeing the Master wear it at Summer Solstice on Peace Prayer Day was a thrill! Many times when I was having personal challenges he didn’t counsel me, give me a meditation, yoga set or prayer to do. Rather he supported me by giving me some beautiful fabric, telling me he wanted it long or short sleeved, lined or unlined, and that he wanted it done as soon as possible. The creative process became my meditation and I was blessed that he wore my prayers. It was an unspoken understanding for which I am forever grateful. In my life, Guru has surely blessed me and I feel truly wealthy! SS Sarb Sarang Kaur Khalsa started on this path in 1974 in Phoenix, Arizona. She began sewing bana for the community and made a living from it until 2004. Currently she works as a Chaplain and Spiritual Care Program developer at Presbyterian Espanola Hospital. She loves to design and sew quilts and wall hangings (she often donates them to raise funds for the Espanola Hearts and Hands group). She lives with her husband Hari Mander Singh and their puppy Ruby. 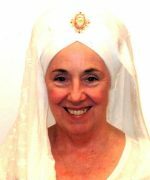 Three of her four sons live nearby: Meeri Peeri and his partner Blake; Dharam Singh and his wife Lakshmi Kaur and their two children, Amrit Dev Singh and Nam Jivan Kaur; and Gurujot Singh. Her fourth son, Harijot Singh, recently moved to San Diego.